Welcome to my site. 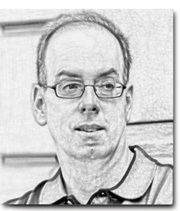 These pages provide some information on my educational and professional background, and my current research and teaching activities. I was recently honored to be named a co-winner (along with Brian Vick) of the Hans Rosenberg Book Prize given by the Central European History Society. 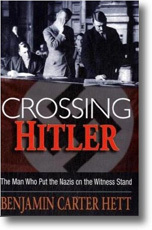 The Rosenberg Prize is for the best book on Central European history in the past year; I was named for my book Burning the Reichstag: An Investigation into the Third Reich’s Enduring Mystery which appeared in January 2014 from Oxford University Press (Brian Vick was named for his terrific The Congress of Vienna: Power and Poliics after Napoleon). 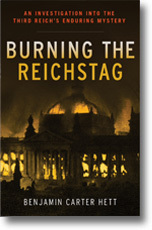 The German edition of Burning the Reichstag will be called Der Reichstagsbrand. Wiederaufnahme eines Verfahrens and will be published by Rowohlt in the summer of 2016. The new edition has given me the opportunity to bring some new material into the text. I expected some controversy over the book. Nonetheless the results have been surprising in several different ways. For more on this, please see the “Reichstag Fire Debate” tab on this site. 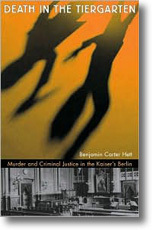 (c) 2009-2014 Benjamin Carter Hett. Design and Layout by Graham Brice.